If I tell you right at the beginning that all pictures in this post are in colour, you may understand why there haven’t been as many as usual and why Message in a Milk Bottle is suspended until better light. It’s not just that the skies are solid and dark - but it now rains almost every day too and my camera objects to water. It’s raining hard as I write. Sometimes, it reduces to a drizzle and sometimes it stops for a few minutes - then it starts again. Even in those few moments, there are spits in the air. when it comes into flower. After that, it seems to vanish until its fruits appear (sloes). I think it is specially beautiful before anything happens. Underfoot, the earth has gone mushy and some plants seem to be dissolving. Hedgerows appear to be faring better than gardens and there is, in both, a greening. I was planning to put some examples here - of the lichen which was yellow but which now isn’t and a little plantain seedling (Plantago lanceolata (Ribwort) not an exotic tree like Musa balbisiana, with fruits that look like bananas. Despite the daily rise in temperature and the almost constant rain, we haven't (yet) gone tropical!). But, when I included photos with too much green in, they looked out of place. It's as if there are parallel worlds - one (at foot level) where plants continue to grow and another where everything is apparently static - still in waiting. In my last post, I looked mostly down, where the growth is. 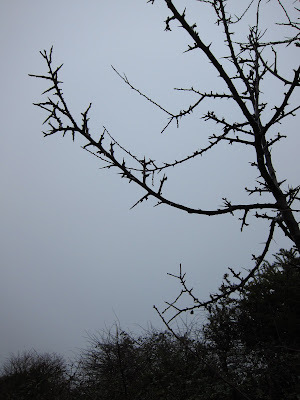 In this, I'm risking turning the lens up (quick up, quick down before the view goes fuzzy and the rain leaks in) where branches and dead leaves, shrivelled fruits and desiccated plants make wonderful silhouettes against the annoying and constant grey. For the bushes, trees and last season's plants are still worth looking at. Detail is gone - but their silhouettes are specially lovely. I’m putting a few here. There are more to come for they are so delicate, so lovely, bombarding you with a hedgerow full in one go would be too rich a feast. The photos are STILL wonderful. Thankyou for braving the weather! Thank you Hazel. I like winter a lot. There's a great deal to see but it's often hard to take photos. I'm wondering if I should buy the kind of camera cover used by divers - though I am not sure what the quality would be then! I hope the weather where you live is tolerable. Your header looks a little alarming. This winter is so unpredictable, I too am sick of it. Spring will be very welcome this year. There are signs of spring - just hoping they don't rot before they get any further! This is this is what I envision when I think of UK winter weather. It is stark, but still beautiful. Thanks for braving the gloom for us! Unlike many others, I am not lowered by these dull days and constant rain - indeed, I actively like them. I'm an autumn and winter person and enjoy splodging through puddles. However, I am also a blogging type of person and get very frustrated when I can't keep up to date with postings. Odd that. Your photos perfectly capture the mood of a dreary winter day. I think burr oak is like blackthorn, in that it is at its most attractive and interesting when the branches are bare. I like it best when there's snow on it, but even just the twigginess is interesting. Hello Mr McGregor's Daughter. I don't think I've ever seen a burr oak in real life - just seen beautiful furniture made from its wood. 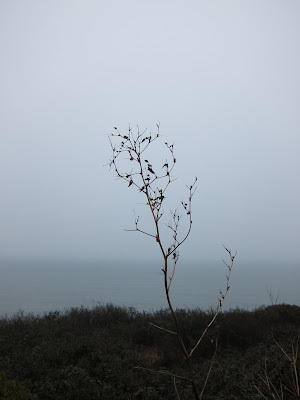 When the blackthorn is bare, it fits its name. Chicory is the ingredient in my favorite drink, Pero. I think starkness is a beautiful facet of nature. Is the chicory in Pero this chicory or the endive kind? This chicory is delightful in summer - lovely, sky blue flowers. Hi Lucy, thanks for visiting my blog - I can see we have indeed been having similar weather! I was rushing to the house and back with the camera while pruning the birches in an attempt to protect it from the rain! I love your silhouettes, they make even the dull grey look pretty, particularly the Ground Elder one. Your pictures do remind me of the dreary days we have been experiencing here in VA of late. It has been so cold and miserable. The branches against the background are beautiful. Lovely capture. Another set of great pics,Lucy! Hello Plantalicious and Genie. Many places seem to be having weather like this at present - even ones far apart. Hello Mary, Lui and Angie. Pleased you like the photos. They are good memories of a grey day. While you have had all that rain we've still been getting snow. I can totally understand your problem with the light - we had fog aswell this week aswell and trying to do a 365 in pictures for me can be tough as I want to photograph nature rather than things inside my home. I really miss the colour green as I have not seen our grass since the last week in November. It's lashing with rain here today so my camera won't be out for long either. We've got mushy slush to deal with here. The only silhouettes that I have been able to capture have been the hogweed seedheads against the snow. Lucy, I bet when they hear that you live "near the seaside" some people conjure up an image of glorious sunny days and blue skies over vast expanses of golden sands... How wrong can they be? I am a Cornishman, and I know how bleak the cliffs can be in Wintertime. The gorse bushes and thorns are still beautiful to look at, for all their starkness. Hello Rosie. I hope your weather is now more comfortable. Seedheads against the snow are good for photgraphs and often beautiful in their own right - but awkward if that's all there is outside to take pictures of. Hello Mark. It can be cold and rainy here but it is always beautiful. Fortunately, our prevailing winds come from the west so they are generally warm. When they come from the east (which isn't often) they can be very strong and very cold. In the summer though, the holiday beach in Weymouth is precisely what one would imagine from picture books and expect on postcards - donkeys, ice-creams, sand, swimming and picnics. How odd to live (occasionally) in a black and white landscape. It was dark here all week and I feel sheepish admitting how glad I was to see the sun the past two days -- I usually mock people who don't appreciate free irrigation from the sky. Yours looks like a challenging landscape. Snow, I've found, gives a much better light for photography than does rain. On the other hand, although I like snow - I'm glad we don't have as much as you! It's odd how blogging distorts one's view. I'm much more bothered by rain than I used to be because it means I can't be looking through a camera lens all the time! Rain can bring much more serious problems though and, taking a global view, it is showing how destructive, as well as how irritating, it can be. You might like to know I've just posted the latest article for Lucy and Leafy. It's called 'A Portrait of Prince Charles' and compares the way the artist Bryan Organ chose to compose that painting with the way I photograph plants. Even if it is dark and gloomy it makes for lovely picturs!